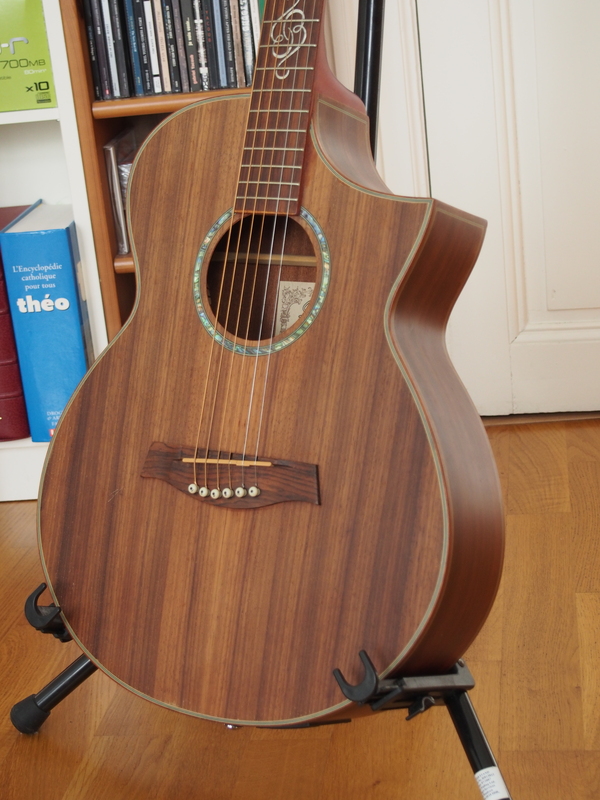 EWC30PDE, Acoustic-electric Folk/Western guitar from Ibanez in the EW series. heads on fire's review"Good player acoustic." This is a neat acoustic guitar from Ibanez. As far as playability is concerned, this guitar benefits from having a narrower body depth than most standard acoustics. This makes the guitar more comfortable to hold. The neck has a good feel to it - chord work was easy, as well as single note soloing. The string spacing at the bridge is excellent for fingerstyle playing. Cosmetically, the Padauk top is quite unusual to look at, but is very attractive. However, the inlay at the 12th fret is pretty cheesy. This guitar sounds good enough for stage use, and just practicing around the house or songwriting. For the recording studio, I'd be inclined to play something with a bit more low-end depth, as the bass end of this axe is a bit shallow. But the crispness is definitely there, and the included SRTn and B-Band UST pickup system gives the EWC30 a flexible package capable of tailoring to the room, as well as eliminating feedback coming from the PA or monitoring system. Overall, this is a good guitar. It has a better playability and look than it does tone, but that is the type of trade-off that is made when shallowing the body depth and cutting out a dramatically shaped cutaway. The wood selection is very nice, and the fit and finish is right on for this price range. My one minor gripe is that Ibanez put a really cheesy inlay at the 12th fret - why don't guitar manufacturers leave lower-end guitars alone? I've seen so many that are very nice, but then the look is all off when someone is feeling "creative" in the inlay department. I realize it might be a way to brand the instrument a bit further, but I really think Ibanez could have done away with the inlay all together to make the guitar look much classier. But once abitué is a fun Rhythmic. Experiment ... it is faulty ... the 3rd and 4th strings sound very oddly, I reported to the shop and I bought it, he told me they had this problem with this model, the battery holder or qqchose like that which vibrates .. They have me as they could recall, but it happened again not long after. 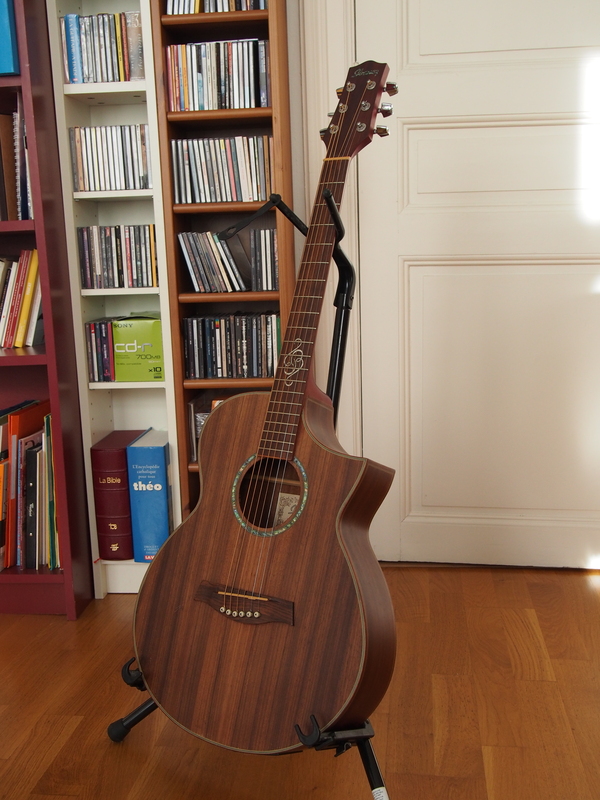 So, I played it more, it is out of warranty, I would sell it but who wants a guitar that makes noise "digiridou". By adding the reference I put a picture big enough for us to realize how beautiful this guitar is: very little varnish, wood bindings are different color (not plastic as in many cases) is the most beautiful effect. 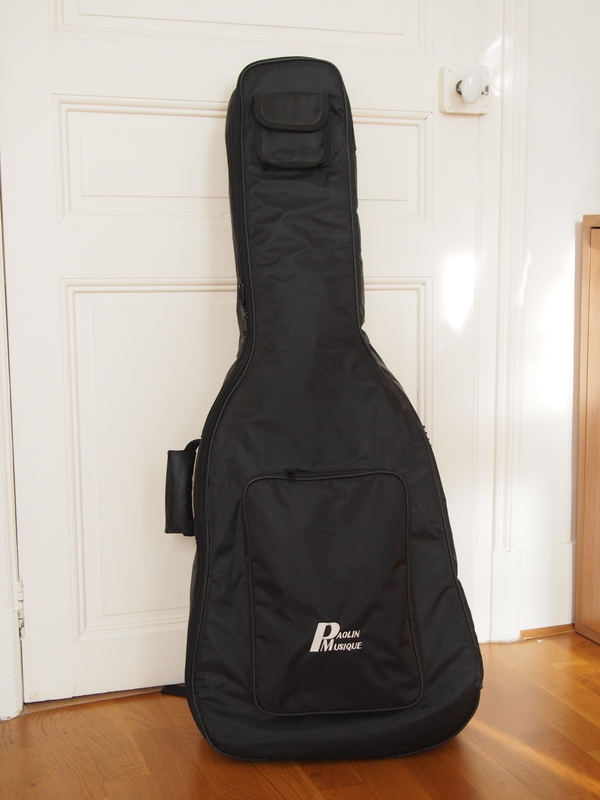 It's a small guitar, the lower body is only 10 cm. wide and there are only 21 boxes. 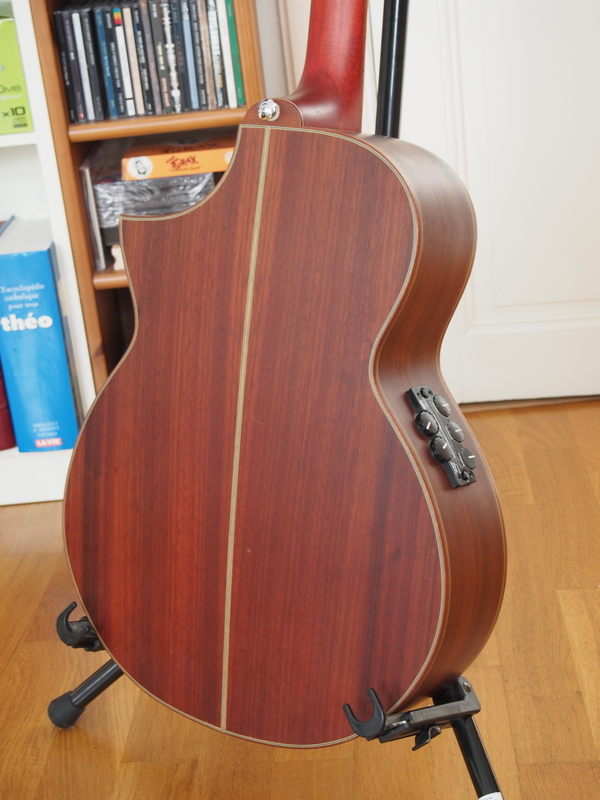 The cutaway is dug, but it is only cosmetic: it does not have access to more acute than other electro-acoustic. Because of its small size it is very enjoyable to play and the handle is very comfortable. A very good point for the tuner and battery provisions very accessible. there is a very big flaw that has only increased over time: the mechanics are very bad when it turns a little bit nothing happens when running a lot, it is immediately too away. It's frustrating quickly. This defect is not on my copy, I had confirmation that other users have the same problem. Acoustic sound is more powerful than what we expected given the small Taile but much less extensive than a dreadnought, for example. This is not necessarily a fault because as the low end is not 'bloated' the overall impression is well defined. There is also a button 'phase' which I have not grasped the utility is probably the device for reducing feedback. The difference in level between the output jack and the XLR output is enormous. I have not had the advice of a sound engineer but my little mixer, XLR clipped it a little faster. I use it for 2 months and I am very satisfied. It has everything to please me: the unusual look very successful, very good gameplay, an expanded sonic palette. My impression is mixed on the finish, given our usual prejudices about the 'Made in China' is a pleasant surprise but I think that with a look and level of equipment similar to a retail price of € 350 it may be hiding something ... also the first day I heard a strange resonance uncomfortable, as if a piece of metal vibrating in the box but it was quickly stopped, I put it on the account a period of adaptation to a stable thermal environment. True most are built-in tuner and battery compartment door is easily accessible. It is a favorite purchase: a friend bought this guitar and when I saw her and tried (well, the guitar ...) I said 'I want the same'! Very good ergonomics, if one does not solo. The sound is actually very good, do not read the opinion below. Its vacuum very warm, lots of natural harmonics. Once connected, the sound is excellent. I play straight into the studio to the console. To play rhythm and do a few solos, so it is perfect. 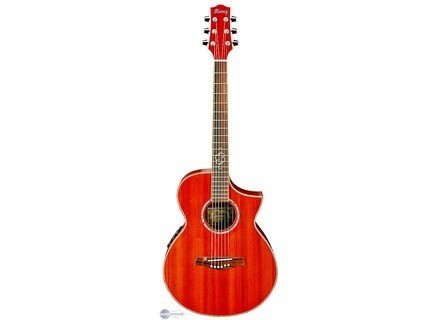 To play live, I prefer a guitar that has more trunk, more "open" in sound, but it's a great guitar for the price. I use it for 1 month. The best is its price (300 € at the Dealer Sons in Lyon) and his exotic look.